India created history on Wednesday, (September 24, 2014) becoming the first country to successfully get a spacecraft into the Martian orbit on its maiden attempt. The Mars Orbiter Mission (MOM), also called Mangalyaan is a “technology demonstrator” project aiming to develop the technologies required for design, planning, management, and operations of an interplanetary mission. NASA’s The Canberra Deep Space Communication Complex in Australia which is managed by CSIRO Astronomy and Space Science got the first signals which were relayed to the Indian Space Research Organisation (ISRO). November 5, 2013: ISRO’s PSLV C25 launched India’s Mars Orbiter Mission from Sriharikota, Andhra Pradesh. September 24, 2014: Mars Orbiter Mission reaches the intended orbit around Mars, making India the first country in the world to have successfully launched its mission to the red planet on the very first attempt. Bhutan was the first country Indian Prime Minister Modi visited after assuming office in 2014. There must be something special about Bhutan besides being India’s neighbor. 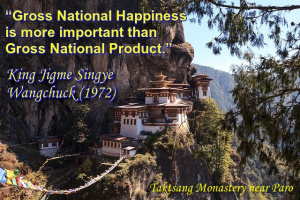 Yes, there is very special reason why informed people go to Bhutan: its development paradigm of Gross National Happiness (GNH). Bhutan pursues holistic happiness, not GDP growth. It is the only country in the world that does not measure its progress in terms of economic expansion measured as GDP growth. 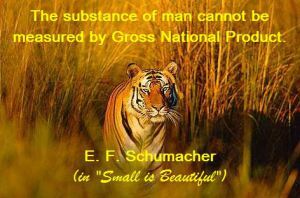 Its development model is easily the most sustainable and is the envy of the world. No wonder the UN and global community looks towards it as a role model of sustainable development. Bhutan’s holistic view of development has the potential to transform humanity’s relationship with nature, restructure economies, change attitudes to food and wealth, and promote caring, altruism, inclusiveness and cooperation.